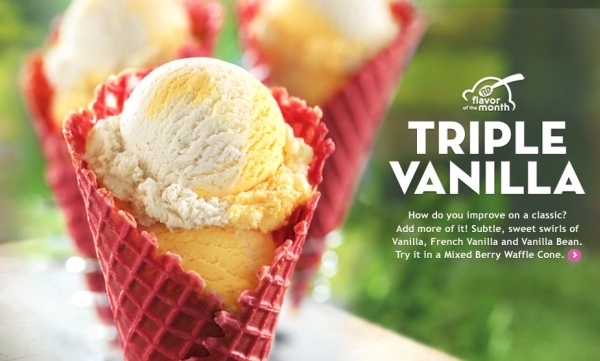 Baskin-Robbins goes vanilla for this June's Flavor of the Month. Triple Vanilla that is. The new ice cream flavor features Classic Vanilla, French Vanilla, and Vanilla Bean ice cream swirled together. As usual, you can get the flavor in a cup or cone, as well as fresh-packed pints and quarts. Carrying over from last month, the Mixed Berry Waffle Cone is still available as a cone option (for an additional charge). The waffle cone is infused with a mixed berry flavor. Why does Baskin Robbins cost so much?